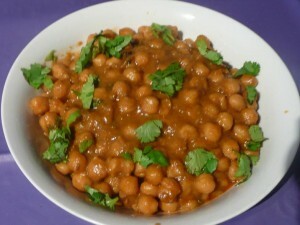 Channa Masala recipe by Ayesha Khan at DesiRecipes.com. Heat oil and add onions, ginger and garlic . Let it becomes golden color. Now add chilli powder+haldi +salt +green chilly+coriander powder and little water. Add chopped tomato and cook until tomato gets tender. Add chick peas and water.Mix well, reduce the heat and cover and allow to cook for about 15 min till the chick peas has absorbed some of the sauce. Add garam masala+coriander leaves and green chillies for garnishing. The required measurements has been fixed. Thanku for pointing out Aqsa. You have metioned salt and corriander powder in the preparation but not in the ingredients. How much quantity is required for both? ?